Some of you might have already known hahanoyume 母の夢, is Japanese for Mother’s Dream. 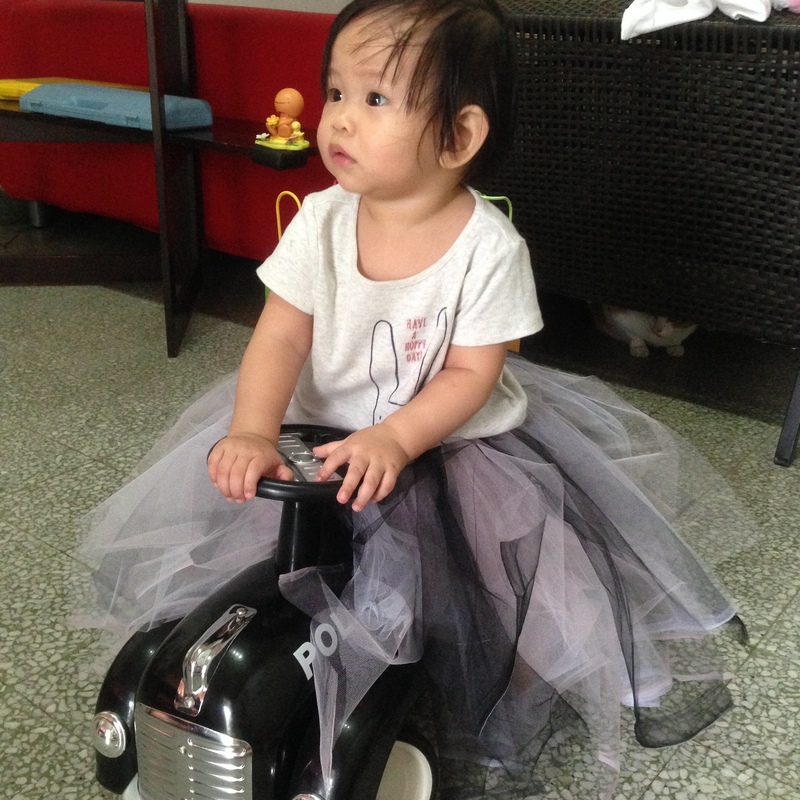 It was my dream to be the primary caregiver to my baby girl. My dream to grow the business above and beyond. My dream to be able to contribute to a greater cause. I have always had a calling towards children who is in need – be it in education, basic livelihood, and health. No child deserves to suffer through any life threatening disease, or be refused their basic right to education and clean food and water. Which is why a portion of our sales goes to World Vision who provides mainly for children and families living under poverty. But I would like to do more. I would like to reach out to the urban poor and the sick. The child whose parents couldn’t afford to get them books or basic school supplies for they don’t have enough to go by each day. I believe that education itself is able to lift a generation out of poverty. Or even the sick child who’s living long days in the hospital. Happy books will definitely cheer them up, don’t you agree? 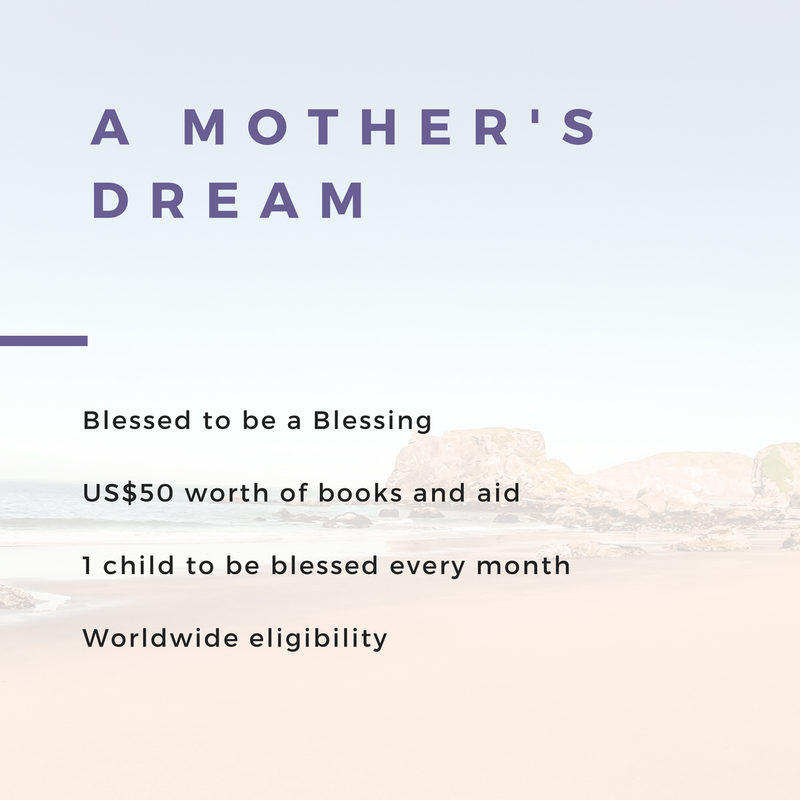 So I would like to do just that – BLESS a different child EACH MONTH with US$50 worth of books and basic aid. And I’ll need YOUR help to point me to the right deserving child. I know US$50 is not a lot of money, but it is what I can afford to give at this juncture. And I’m confident this amount will only grow in time to come. So PLEASE. Please NOMINATE a child whom you think deserves this help by emailing me your story about this child. And do help me share the cause to your friends by sharing this post on your social media. I hope to be able to bless as many children possible every single month. All around the world. And now that I’m left alone to run the show (oh yea, forgot to mention that F and S have decided to spend more time with their families, hence are no longer in the business), it can be quite daunting at first (I’m a techie idiot! ), but survival skills kicked in the very next day and I had to pull myself together and just continue the marathon. Slow and steady wins the race, they say. Well steady yes, not too slow, I’d say. The world is ever changing and competition is rife. Consumers are getting wiser by the minute. They expect perfection. And that is what we strive to offer. In the quality of our fabric, to how we wrap and box our kimonos. The speed we deliver the boxed kimonos to how fast we reply customers’ queries. I even posted the certificates of origin of our fabrics on our website as I believe in not breaching our customers’ trust in us. Depression – what’s it like? The recent news of a mother jumping to her death 10 days after her delivery shocked many mothers, bringing back memories of our own journey as new mums. Many have blogged about it, or shared about their own experience on social media. I personally have experienced what they called “baby blues” in the second month, postpartum. I don’t think I was depressed (coz I know what it actually feels like being depressed, but we will get there soon enough), but I was definitely resenting the very situation I was in. The total lack of sleep (as the baby was up every 1 hour, and it took another 45 mins to put her back to sleep), the “shortage” of breastmilk (or so I thought) with the constant negative input from the elders, the witching hours when baby would cry for no reason (not convinced it’s colic, as gripe water solved the problem in the end, after 3 weeks). I remember leaving the baby to cry in her cot after yelling at her to stop crying, shut her room door and went to our bedroom and shut the door as well. And screamed. And cried. And cursed. And hit myself. I needed to feel the physical pain as I was numbed from all the regret of having a baby. The life that I thought I’d lost. No more sleep-ins. No more traveling the world. No one told me about how hard it was going to be. The books I bought didn’t warn me about postnatal remorse. I didn’t sign up to be a demented mother resenting her own child. I went back to her room after one hour. And she was still crying. But she stopped eventually. And I stopped resenting eventually too. I suppose I had it easy. I was the lucky one I guess. Some mothers had it much worse. Probably lack of spousal support. Or too much negativity going on around her with family members spewing accusations that she’s not doing enough. That she’s just acting up. That she’s just being a drama queen. And it takes just one trigger to flip the switch. And she breaks. But you see, postnatal depression is not the main culprit here. The people surrounding the patients are. There are so many people out there suffering from depression, the colleague sitting across you. The lady who serves your coffee at your favorite coffee joint. The cab driver. The person sleeping next to you. And because you never bother to read up about depression and learn to pick up the signs, you’ll never know what to look out for in a person suffering from depression, and help that person heal. I suffered from depression back in my late-20s. I was stuck in a job I hated, the boss was sexually harassing me, and I couldn’t leave the job until I found another one (needed to support my family, don’t have a dad, remember?). So I cried every single day. For close to 6 months until I got a new job to move on to. The crying stopped. I should be feeling fine by now, but I wasn’t. I was perpetually shrouded in a “dark cloud”, looking fine on the outside, but feeling miserable on the inside. It was torturous to attend social events, even a small friends gathering would tear me inside as I dread meeting and hanging out with people. I would cry in the showers for no reason. I would hit myself just to feel something. I would wish to just disappear from the face of the earth. Imagining myself getting hit by the bus. Imagining slitting my wrists. Pondering over the bottle of sleeping pills at the pharmacy. But the next day, I’ll just pick myself up, and get ready for work. Did pretty well at work actually, bosses thought I was a very hardworking and commited employee, staying back during lunch hours to work instead of going out with colleagues. I needed to complete my work, that was my excuse. Yea, good excuse really. Met my KPIs, bosses real pleased. But no one knew the real reason. I was suffering. I needed to be on my own. But I knew myself better. This couldn’t be right. I can be picky with people, whom I hang out with and befriend. But there’s no way I can feel so low all the time, day and night, wishing to disappear. So I read. A lot. I researched on the web and read all I can about what I was going through. And I went to see a doctor and told him about my own prognosis. “Doctor, I think I have depression”. He agreed and prescribed me Paxil, a type of SSRI (selective serotonin reuptake inhibitor) to manage my condition. It didn’t work immediately of course. It took time, and for a long while, I didn’t have any feelings at all. I didn’t feel low anymore, neither do I feel excited or happy. I just felt flat. Like meh. Like whatever. But after a couple of months later, I started to function normally again. I didn’t feel like quitting life anymore. I could even joke with my mum and call my meds my “crazy pill”. My then boyfriend (who’s my husband now), didn’t know anything at all about depression. He didn’t read up about it nor made any effort to. I was the one who had to educate him about the illness. Thank God he listened and trusted what I told him (I mean, I could have been bullshitting him, and he would just believe me). And with the info I gave him, he stood by me and was patient with me on my road to recovery. A rather long road. Close to 7 years actually. Yea, depression don’t just leave you in a jiffy after you take your meds. It’s not the common cold, you know. LOL. And I decided one day to stop the meds myself. Let’s try to do this, I told myself. 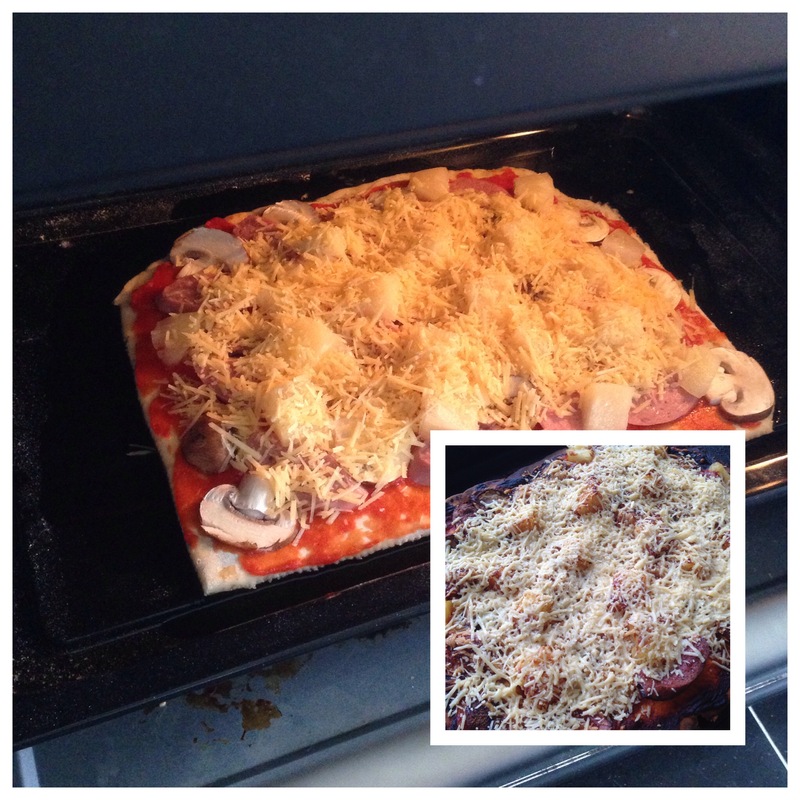 Well, I failed. I went back on meds. But I never gave up on my hope to be meds-free. You know why? Because i want to rid my system of these horrid chemicals. Paxil causes complications for pregnant women, including the risk of serious birth defects. I may not have decided that I wanted children at that point (I was already married by then), but it takes 1 whole year to fully get rid of the poison from your bloodstream. So I had to do this for my future child (we decided to try for a baby 1.5 years after I was “clean”). And in those 7 years, no one knew. Bosses didn’t know. Colleagues and friends didn’t know. Why? Coz it was a taboo. What if they think you’re mentally incompetent for your job? How do you progress in your career? You must have had the devil in you which made one go “mad”. Or not praying enough which was why one is sick. It’s just hormonal imbalance, dear people of “faith”. Of course, I prayed. I prayed for a faster recovery. But just because recovery didn’t come sooner, it does not make me a person of lesser faith. Well, the moral of the story? Read up about the illness folks. It’s not so much a taboo these days thanks to the advent of social media. Everyone’s got their own struggles, so stop being judgmental and presumptuous. Don’t be a hypocrite and jump the gun accusing another person having a weaker faith. Shame on you. It’s a medical condition. Be aware of the symptoms and be there for the patient. Doesn’t matter what’s the trigger point. What matters is your continuous support and understanding, and your walk with the patient, no matter how long and arduous the walk is. My baby turned one today. Oh, how time flies! It didn’t feel like it has been 12 months already, but she has since grown so much. Apart from the obvious size growth, it’s amazing how much this little human being can achieve in her milestones, sometimes a matter of just overnight! I’ve learnt that when she’s particularly fussy and clingy, and having frequent waking intervals at night, her little brain and body is preparing her (and us!) for a new skill and ability. And then, the fussy phase will pass, leaving us room to enjoy her new found ability, be it standing or dancing, or even calling mama (well, in her case, it’s meh). Before you know it, the cycle repeats itself again, with another bout of sleepless nights (for the mum, of course). Which is why, at times when she’s a handful to handle, I tell myself, this will not last. Before I know it, she will be old enough to drive! Don’t drink (milk) and drive, lil’ missy! I guess it’s because of this very fact (that they’re grow up so fast! ), most mums will make every effort to capture moments of their baby(ies) growing up, be it still shots or videos, whenever they possibly can. Heck, my iPhone memory ran out of space long time ago, till I had to save the photos into Dropbox and Google Drive, which also has since ran out of space too! So now, it’s a 1.3TB external hard drive. Gosh. Babies. They are just the best thing to hold on to and cuddle (if they let you). 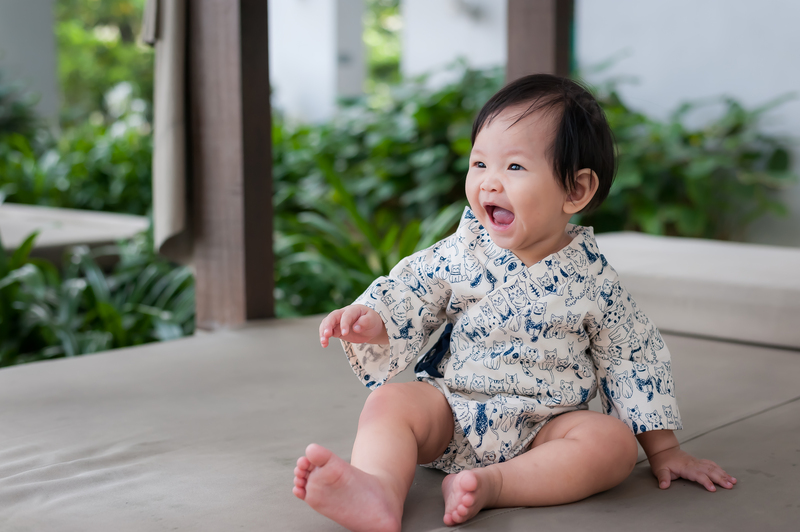 And recently, we had 2 newborn babies photoshoot (credits to bluecicada photography) wearing our hahanoyume baby kimono rompers. I decided that a video montage complete with a Japanese haiku, A Star Festival Song, is befitting the beautiful photographs. Enjoy the video! And do leave us a review, a like or even share the video with your family and friends! To my dearest chunky munkey. I would give you all the stars in the sky if I could. But you gave me the universe. You’re the best present any mum can ask for. Happy birthday, my precious. Most of my high school friends who are married, are now mothers of 2 (at the very least), with the eldest either attending kindie, or are already in primary school. 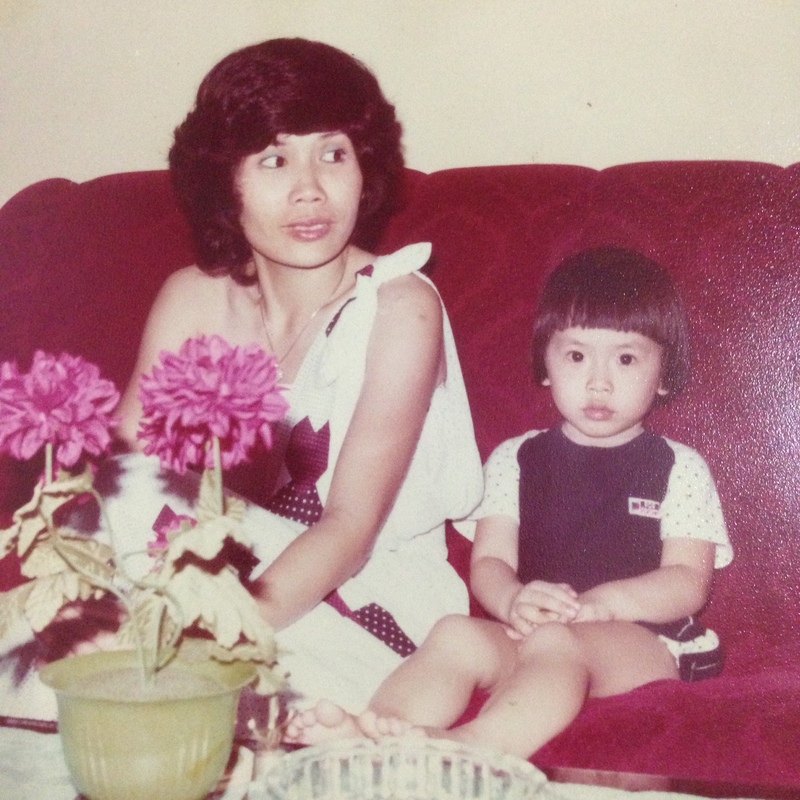 I think I’m one of the late comers, having a child when I was in my mid-30s. And it was by choice. 6 months before I turned 35, I had a very objective talk with my husband about whether we should embark on parenthood. Both of us were perfectly happy and contented with our lifestyle. Care-free, able to just pack our bags and travel whenever and wherever we want to. We would lose our freedom, both time and finances. Whatever time we have will have to go to the baby. What we earn will have to go to the baby. Basically, our whole entire life itself! Parenthood scared the sh** out of both of us. And not forgetting my career. How to climb corporate ladder with me being away on 3-months maternity leave, and having to take emergency leaves whenever the baby is unwell. How to stay and work late hours when you have a baby waiting for you at home? I struggled with my own selfish needs and aspirations. But then, I told my husband K, as a matter-of-fact kind of way, that I wouldn’t want to die regretting not having tried for a baby. Not knowing what it’s like being a mum. Yea, simple as that. I don’t want to leave this world remorseful, with regrets. And because I was at my mid-30s, being married for close to 4 years without any “accidents” (if you know what I mean 😉), we gave ourselves 6-months to conceive, starting from 31 Dec 2013 (the talk took place in mid-2013). If nothing happens by end of 6 months, we will just call it a day. It’s fated that we will not be parents. Straight-to-the-point kind of decision. So we went about our usual routine during the rest of 2013, and we went on our annual pilgrimage to Bangkok in end December to visit my uncle and his family (my late mum was a Thai of Chinese descent). AND KAPOWWWW!! The deed was done. On 31 Dec 2013 (or one of those days. Lol). Never have I seen anything as accurate as this. And K used to say that I conned him into it, telling him that it’ll take at least 6 months before anything happens. And now he had “lost” 6 months of fun time (ie traveling). Crazy traveling fanatics, we are (till today!). Fast forward to today, it’s definitely a life changer. The rest is history. And all of you know my story from then on, so not going to elaborate. I’m glad we decided to hop unto the parenthood bandwagon. Reminiscing back to when I see my girth size grew bigger by the week. Thank God no morning sickness or any other complications from my herniated disc. The baby will kungfu kick furiously inside, till I can actually see my belly expand and move sideways and up. I naively thought I could survive birthing without epidural (no thanks to superhero F who did without! I realize my pain threshold is very much lower than hers. Sigh) but cringed in pain when the doc inserted his fingers to check my dilation. I begged the doc to increase my epidural but he refused, wanting me to feel the pain so that I know when to push (gasp!). Struggled with breastfeeding. And not forgetting the lack of sleep! Was telling K today how mind bogglingly amazing that I can function normally with so little sleep. Lol. Mums are superwomen, I tell ya. But now to the point of this blog post. Will I have another one? I’ve got 2 friends /ex-colleagues (F being one of them), who got pregnant shortly (second baby for both) after they tendered their resignation. Talk about being stress-free. Your womb literally goes into overdrive just because of the surge of estrogen and happy hormones (cocktail of serotonin-endorphins-dopamine) in your system! And another ex-colleague who’ve been trying so very hard to conceive since the night of her wedding (literally!) but successfully got pregnant after going on a stress-free getaway (I shared with her my success-story’s “secret recipe”. Lol. Hint hint to another friend of mine, J, who’s stressing out on conceiving her 2nd child 😉). Stress-free getaway entails skipping the bungee jump and roller a coaster rides please. 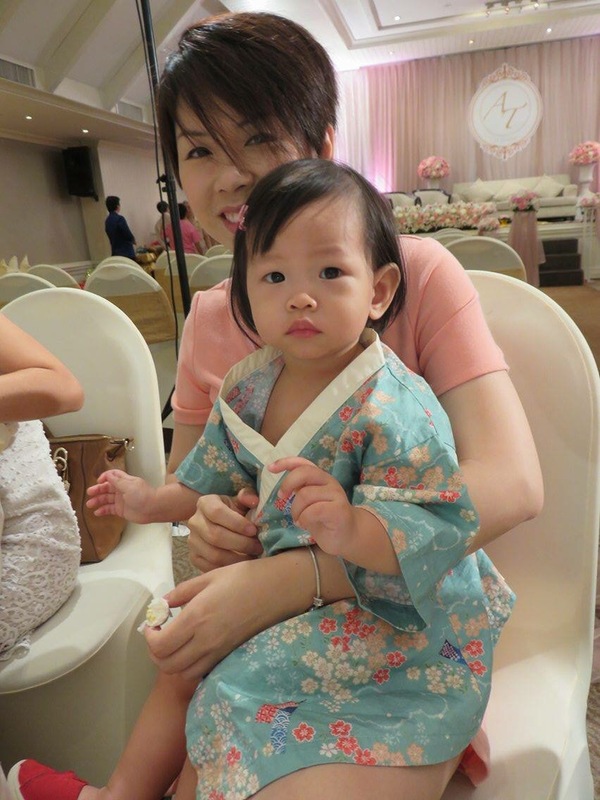 She just delivered her baby girl 2 weeks ago, and I’m pretty sure she’s a very happy mum (her in- laws too I’m guessing coz her MIL was practically stuffing her with all sorts of Chinese fertility herbal concoction!). Just the other day, F was telling me no way she’s having a third one with all the morning sickness going on, even in her 2nd trimester. And not forgetting “pregnancy brain” too! I experienced it myself, forgetting simple stuff, losing your train of thought midway of your conversation (the horror when it happens in a business meeting. Gasp!!). F now writes down every single thing she needs to do everyday, and crosses them out one by one. You know, just in case. Having a strong support system is crucial in times like these. Husbands, please understand the body and emotional changes your wife is going through. Every pregnancy is different. Don’t expect your wife to still iron your clothes and make you breakfast when she’s struggling with morning sickness and lack of sleep due to nursing a sick and clingy toddler. You’re a grown man. Help your wife and she will love you even more. That’s a promise every wife will make to you. I really salute and respect single mums out there (my mum being one of them) who single handedly manage the children’s upbringing and wellfare (not forgetting household matters) all by themselves. There’s this single mother-of-two whose 3 years old boy, Ethan, was striken with leukemia early this year. As a mum, my heart aches terribly for her. But she’s amazingly strong and steadfast in her faith in facing this life extremely difficult hurdle. I don’t know her personally, but her posts on the mothers connect groups in Facebook makes me feel as though I do know a little about her struggle. If you’re reading this, stay strong and continue to be the inspiration to all of us. Our prayers goes out to Ethan that he will be a strong boy, and that he will recover very very soon, and to you, that you may continue to stay steadfast in your faith and that He will bless you and your family greatly. But back to the point of this blog post (finally!). Will I have another child? Let’s list down the pros and cons to it. 1. Another sibling for my child to accompany her throughout her life when we are no longer around. 1. I can’t see how I can split my time and love (and finances) for another child. It will kill me inside to have to spend less time with my precious lil girl. And losing even more sleep?! Can I cope with any less sleep?? Having the stamina to run after a toddler and managing an infant is a whole new level altogether! 2. Education is gonna cost us a bomb with the crazy inflation (coupled with the fact that our currency is devaluing faster than you can say devaluing) happening these days. 3. And being in my late 30s, the risk of having a baby with Down syndrome will be way higher. I don’t think I’m strong enough to cope with that. So, with that, I conclude a no. Call me selfish (for depriving my girl of a sibling), but I don’t think I’ll have another child. Not at this point of my life. When one no longer draws a 5-figure monthly paycheck, and you see your bank balances depleting by the day, especially when you have a new start-up, every dollar counts. Seriously. Before I quit my bank job, the once-a-year long haul holiday is an absolute must, with loads of shopping and dining. Back at home, branded toiletries and make-up. Japanese and Thai eat outs every other day. Imported foodstuff. Even placed a deposit for a Merc! Those days are over. For now at least. Now, my focus is on my child and business. Don’t get me wrong, I still provide the best for my child. I buy all things natural and organic for her, as far as I can. Her wardrobe is more extensive (and expensive!) than mine now. Heck, I can’t remember the last time I shopped anything fancy for myself. Boohoo. But that’s the thing. Mums, generally (those who’s otherwise, please don’t shoot the writer!) are willing to spend more on their children (be it education, toys, clothing, food, etc) eventhough they need to be on a tight budget themselves. So now. In view that I’ve got limited budget, and overseas trip is a no-go (for now! ), what can we do instead? I figured, why not I list down a few not-so-expensive stuff to do with your family, and keep everyone happy at the same time? Here goes. Visit your local cities and go off the not-so-beaten tracks (can’t be too adventurous with babies now, can we?). Instead of checking into your usual (boring!) hotels, why don’t you opt for homestay? They’re affordable, but yet gives you a slightly different experience as compared to a hotel. Of course, you won’t get your standard hotel breakfast and gym/pool facilities, but hey, a break from the norm can be rather refreshing for the soul! The recent trip we made to Malacca, the historical state of Malaysia, courtesy of Mr Hubby who decided to take us for a short excursion to celebrate my new found “corporate freedom”. 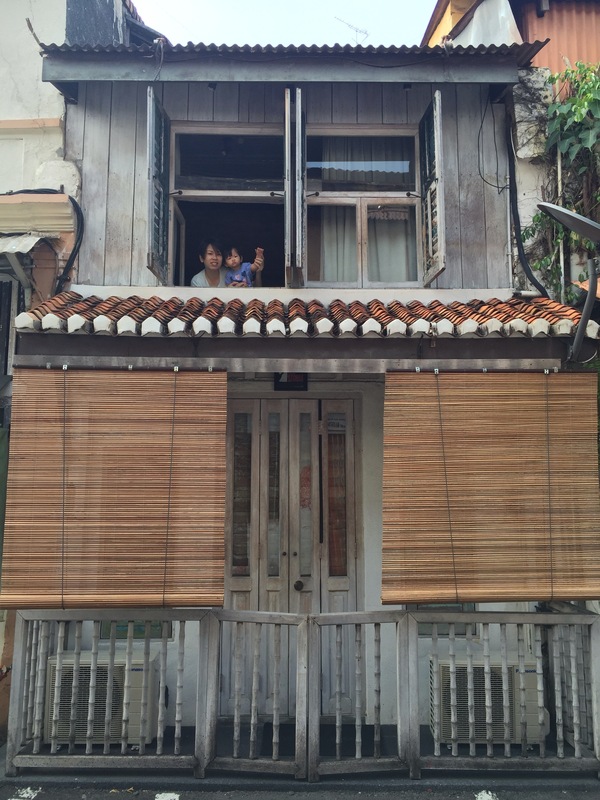 He found us a nice, cosy homestay called The Stable for RM380 a night, located right at the centre of Jonker Street, and I thoroughly enjoyed my stay there. Not super baby friendly, but we managed comfortably. Thanks to the very comfortable king sized bed and soft pillows, M enjoyed her beauty sleep so much, she slept till close to 10am the next day! Looking out at ya from The Stable. Do not let the facade fool you, Inside’s cozy and gorgeous! 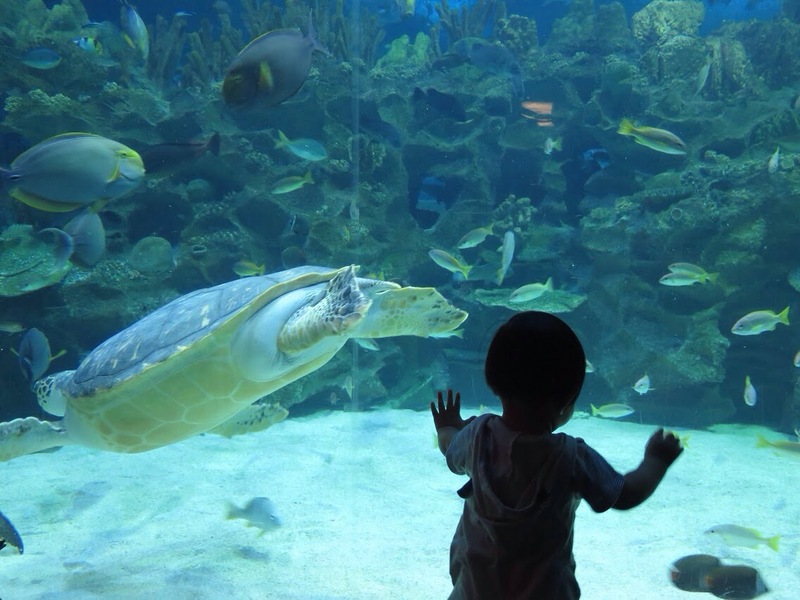 We took M to Aquaria, a bit pricey in my view, but it was M’s first time, and she loved it! So, anything to keep her happy and entertained, i say! Next would probably be the zoo, bird park, butterfly park, Farm in the City. Or you can even go to your local swimming pools for a swim! It costs less than 5 bucks per person, go early and if possible, avoid weekends, to have a decent time of splashing fun with your little one. So yea. Life doesn’t have to be a bore eventhough one is on a budget. There’s much to learn and explore as a family, just need to be more imaginative and willing to try on new things. So. 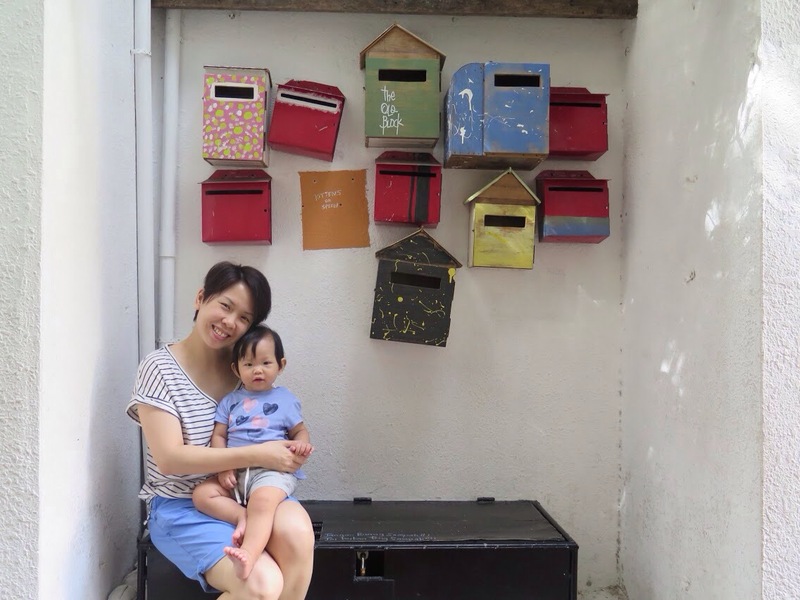 How has it been so far, as a tight-budget-entrepreneur, as well as a mum spending almost every waking (and sleeping!) hours with her child? Well, the mumsy part, not gonna lie to you, there’re good and bad days, mostly good. But there’re definitely some bad days where I wish that I could afford a full time helper at home (uh-oh! I’ve got to watch out for AK47 interrogation from the grandparents after this post! Sigh…). Days when the 10-month old decides that she is all grown up and doesn’t need sleep until it’s very late at night. Days when she decides that she wants to go on hunger strikes and refuse to open her mouth for food, or worse, spits out food that used to be her favorite. Days when I clean up after her more than I clean myself. There was a short period of time when she turned into Ms Hyde at night, and wakes to cry for no apparent reason – I sang, I rocked, I cried, I almost gave up. But, hey, overall, all is good. I enjoy time spent with her – reading, playing, bathing. Yea, I get to bathe with her now. So much fun, I tell ya! She has started to call papa (mama was when she hit 8 months). Her father is over the moon! And she finally cut her first tooth. My nips are so thankful that her pearly whites decide to make a late appearance. At least I don’t have to suffer the bites. Lol. And I have to thank my dear husband for being there to help out, in whatever little way he can. Otherwise, I would have ended up like a vagabond – unkempt and disorganized. I like the fact that our daughter gets to spend more quality time with both parents, hopefully she will grow up to be a wise, intelligent and discerning young lady. Oh, and be a music protege please! Take us to America with you! As for the business, sales has been encouraging. Not gonna sugarcoat things here. There are days when I feel we are doomed (yea, silly me right?). But, we are actually not! We are so blessed to be able to connect to a few awesome mummy bloggers as well as certain channels for a feature write-up – one in August and another in September. One of the interview is next Thursday! So excited, and yet so deeply humbled by the support that we get and opportunities that we have. Oh! And we have finalized the designs for our toddler range (1-3 years old) – kimono tops for boys and kimono dresses for girls (they’re so pweetyyyyyy!). And we hope to reveal them by end August, so do stay tuned! So here we are, at the cornerstone of our impending product launch. We wait with bated breath, anxious of how it will turn out. The finished product, packaging, photographs, website, payment portal, delivery channel, storage, product description, charities, sales. Every single nitty gritty detail has to be covered to our best human ability! We worry. We breakdown. We go over and over every single detail in our head even while we are sleeping. Our livelihood depends on this. We have to now learn how to tie the perfect bow. How to fold delicate tissue paper without creasing it. How to take perfect photographs! 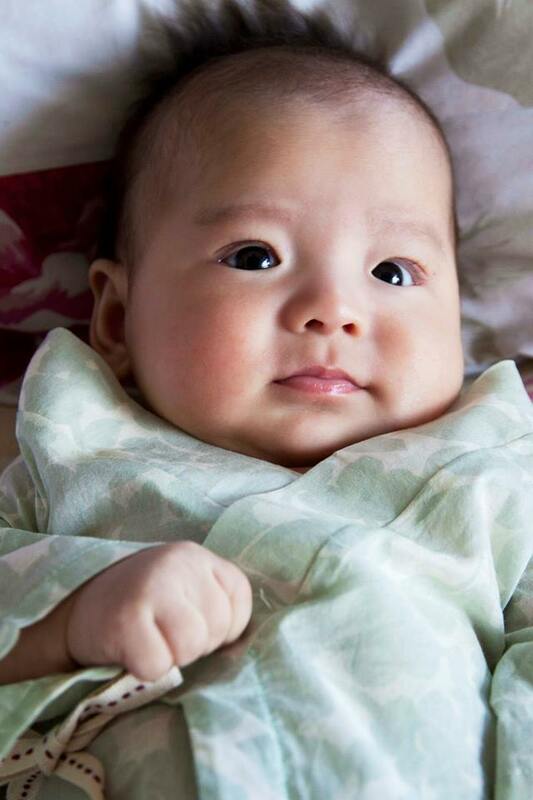 S was such a patient photographer, and we have her to thank for all the beautiful pictures of our baby models as well as still shots of our kimono rompers. Was just chatting with F this morning about the sheer quantity of goods that we will be receiving from our suppliers this coming week. It suddenly dawned on me that we had commited all we have to this business venture of ours. And it frightened me. Will we succeed? Was just sharing with F how our babies’ future depends on the success of this business as we do not have other means of income now. Make it or break it. Or rather, just make it. No other way. It was such an opportune timing that I came across this post on Facebook today by Zig Ziglar– “It’s the size of your hope that’s going to determine how far you’ll go in your life”. Yup. It’s hope alright. We have high hopes that this venture of ours will fly. Hope that the decision we made to quit our corporate careers to do this was the right one. Hope that our babies will have all the opportunities in this world to achieve greater heights, something that their mums never had. As F always say, “We are in this together, no matter what. We will watch each other’s back. Always”. And I love her for that. She’s always so cool-headed, she’s like my anchor in this little voyage that we are setting sail together. And I’m glad that S decided to come on board too. She’s totally amazing with people and guess what? She just delivered our very first gift wrapped parcel to our first VVIP customer today! And many more to go! And all before our actual launch! And all this is only made possible with the help of our manufacturer, this young lady is the most dedicated businesswoman I know. She works till close to midnight at her factory just to make sure everything is on schedule (despite our fabric from Japan reached the factory a week late. So sorry SY!!). I’m just so very thankful for these ladies, they’re the perfect pieces to the jigsaw puzzle, they truly are. God sent. Exciting times ahead indeed. Keeping fingers crossed!